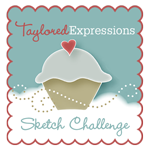 Welcome to the September Release from Taylored Expressions!! September is my favorite time of the year and I love it partly because it is my birthday month (yay!) and partly because there is something about the transition into autumn always soothes my soul! And also because of birthday cake :) ! 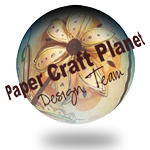 Speaking of birthdays - This September Taylored Expressions is celebrating 7 years of creating and releasing amazing stamps, dies, paper packs and supplies for your crafty pleasure! Woohoo! For both of my cards today - I used the fun and bright Hello Happiness Matched Kit paper pack and cardstock from Taylored Expressions for The first card I made for the birthday release is one using the Block Party - Happy die that cuts out the word "Happy" either within the card fold and still maintaining its structural integrity. 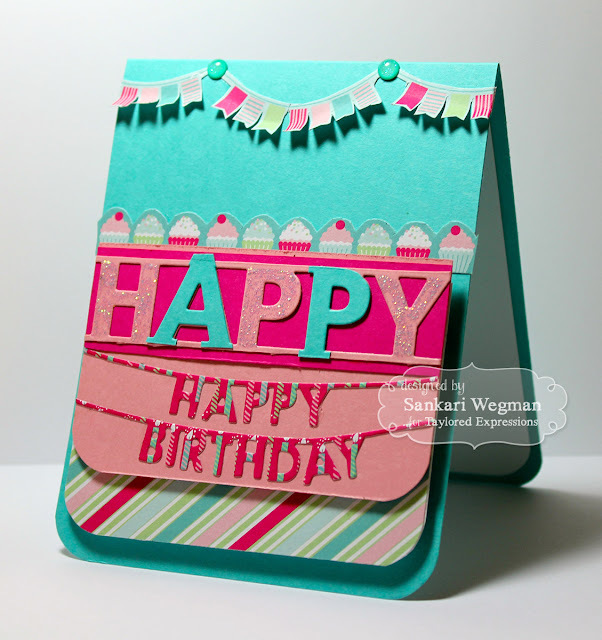 I used this die and paired it with the Happy Birthday Banner die - which dies cuts each word separately into a banner shape and adhered it under the Block "happy" die cut out. 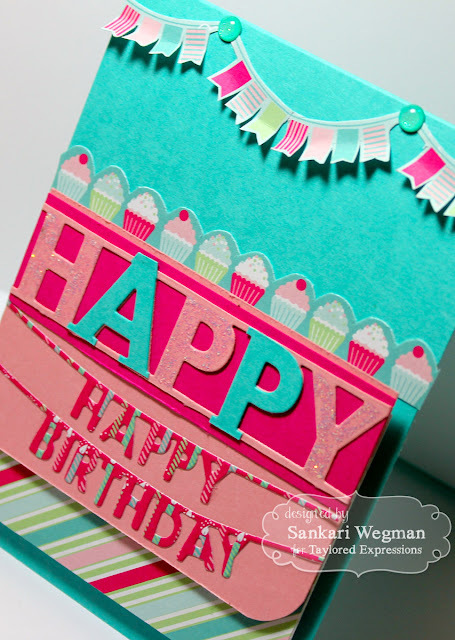 I also cut out by hand some of the banners from the paper pack as well as a line of cupcakes from another one of the design papers in this Hello Happiness paper pack. 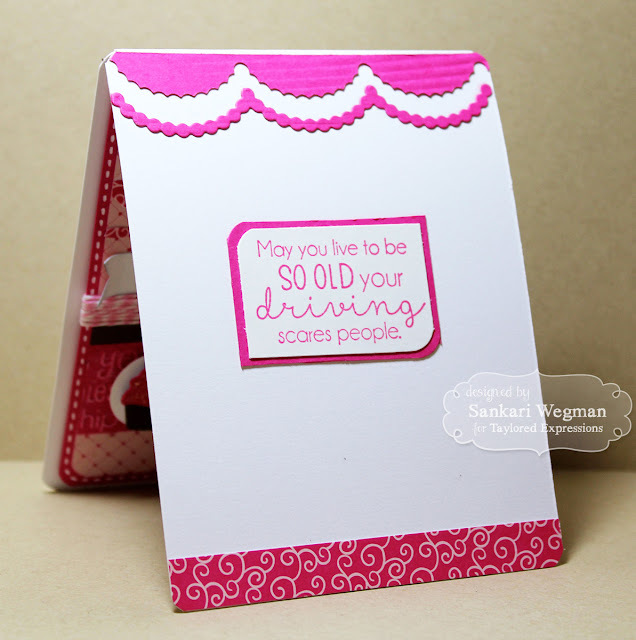 And here is the inside of the card with my favorite sentiment from this stamp set: "May you live to be so old your driving scares people" hahahahahaha!!!! That just makes me laugh!! I love it - what a fun wish! I created a line of cupcakes using the Little Bits - Cupcake die and added some glitter to the cupcakes on the end. I love these super cute Little Bits!! Love those little streamer dies they look lovely. Great cards. Too funny! Love that saying! Darling cards! Beautiful cards! And those sweet cupcakes are sweeeet! Oooh, I want one of those cupcakes, they look soooo yummy! 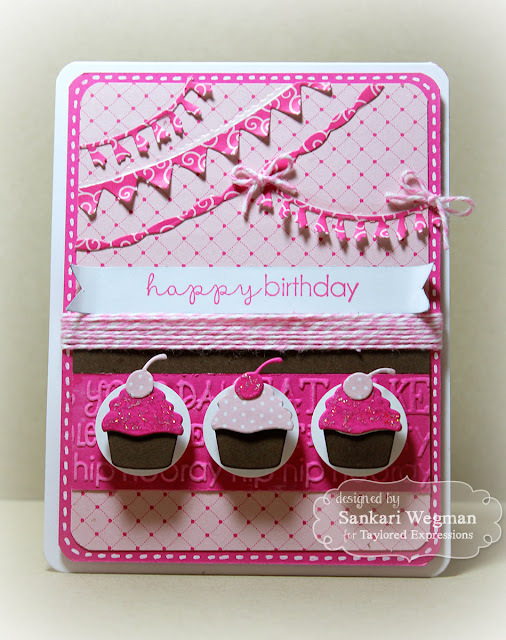 So sweet the card and the new release products!